When Rainbow Six: Siege first launched in 2015 I had no idea that it would eventually ask me to fight alien zombies in New Mexico. But here we are, three years later, with a beefy free update that adds a great new game mode, as well as more weapons, characters, skins and balance tweaks. Operation Chimera, which launched earlier this week, is the start of the new season for Rainbow Six: Siege. The biggest addition is Outbreak, a three player co-op game mode where operators fight against an army of grotesque infected enemies. It is a mode that focuses first and foremost on teamwork. Typically, Rainbow Six is a game teams of military operators try to out-maneuver each other in small buildings and apartments. Outbreak, then, feels like a tonal departure for Rainbow Six. Ubisoft explains the aliens by spinning a story about a probe that crash lands in the town of Truth and Consequences, New Mexico. Within days the entire town and surrounding area are infected with a deadly disease. Team Rainbow is sent in to help clean up the mess. In this mode, players can only pick between eight different operators. The Outbreak roster contains some fan favorites, including Ash, Doc and Tachanka. All of these operators are able to use their special abilities and equipment, such as healing, blowing up walls, and so on. You can jump into Outbreak without having to re-learn how to play. Ubisoft has also added a ton of new dialogue for each operator, giving them more personality. My favorite lines are from the recruit. Previously, in PVP, the recruit was a generic nameless character you picked if you had no other options. In Outbreak, the recruit is fully voiced and sounds nervous. He asks for advice and seems inexperienced. It’s weird to turn the recruit into a character, but I kinda love it too. The whole thing isn’t quite Left 4 Dead, but it’s still a nice touch. There are a total of three objective-based missions, each split into two parts. Most objectives involve guarding bombs, clearing buildings or protecting VIPs. Between these objectives are long stretches of open spaces where players have to stick together against ambushes. Most of these objectives are ripped directly out of the PVP modes of Siege, just slightly reskinned. While mission variety is disappointing, the maps aren’t. The levels in Outbreak are huge and sprawling compared to previous maps in Rainbow Six: Siege. Every map has multiple paths, as well as out-of-the-way areas where you can find extra supplies. The new maps are also gorgeously detailed and feature some fantastic lighting. These maps have no survivors, only spiky red aliens. These infected enemies come in a few different varieties. There are basic grunts, big tanks, and explosive zombies. Beyond the standard stuff, there are also some stranger enemies, like a zombie witch that spawns new enemies, and an alien who gets stronger as its HP depletes. Fighting these new infected enemies feels completely different than the combat found in PVP Siege. Normally, I have to be more reserved while playing Rainbow Six PVP—even the simple act of shooting can be dangerous or risky. But in Outbreak, ammo packs are everywhere and because most fights are ambushes, stealth isn’t important. As most infected enemies die in a few hits, the game throws more enemies at you, making the combat feel faster and more chaotic. 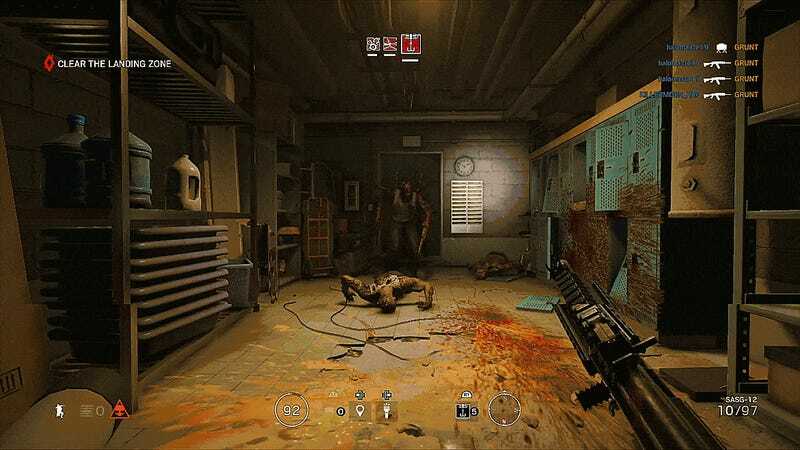 In the main game, combat is often slow and happens in short and violent bursts.In Outbreak, combat is prolonged and can last minutes at a time. Opening up combat like this really shows off Rainbow Six: Siege’s shooting. Just like in the main game, enemies and players can destroy walls and doors—but players can also barricade doors and set traps. Figuring out where to fortify against a coming onslaught is a big part of surviving some of the more intense combat encounters. You can also use silenced weapons to quietly take out single enemies, though this never seemed like an effective strategy. But like PVP, you are still fairly fragile and can be downed quickly. This fragility is more noticeable on harder difficulties, which turns on friendly fire and makes enemies more durable. Having a good team is essential in Outbreak. Luckily, the Rainbow Six: Siege community is up for the challenge. Every match I played on PS4 was filled with players who were helpful and collaborative. In the main game, all of the different operators, maps and abilities create a complex meta where players can only excel through ample verbal teamwork. 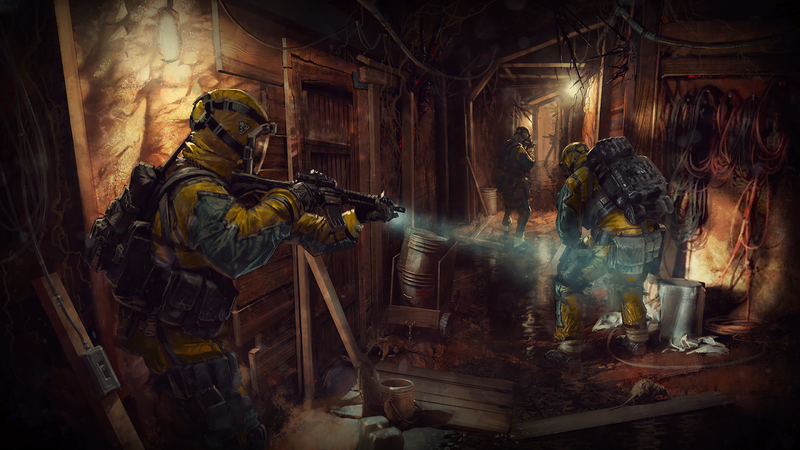 In Outbreak, the objectives are similar, but enemies are less intelligent than real players and they have limited abilities. After years of setting up complex defense and attack plans against skilled players, many R6 fans can quietly work together to fight off some zombies. The players I ran into weren’t very selfish either, freely sharing resources like health and grenades with one another. It’s been a great experience. Outbreak is completely free for anyone who owns Rainbow Six: Siege. The mode is fun, even with random players. However, the Siege community isn’t happy with the rewards that Outbreak doles out. Completing missions doesn’t earn players new loot packs or gear items, which are things that the community values most. The mode does, however, have challenges that can earn you some in-game currency and gun charms. Beyond that, all the new Outbreak skins and costumes have to be bought using real world money, causing some players to accuse Ubisoft of greed. Despite this community reaction, players do receive four Outbreak loot packs for free, and while the rewards aren’t fantastic, I had a great time while playing these new missions. Outbreak is worth playing on its own merits. It seems like the update is bringing back a lot of players. On Steam, Siege just set a new record of active players with an active peak population of over 166k, a new record for the game. Siege is also getting more popular on Twitch, where as of this writing, it is currently in the top ten most watched games despite being three years old. Despite some of the negative reaction, it’s clear that Ubisoft’s master plan to continue pursuing “games as service” is working. Outbreak is an impressive start to start this new season. The free new mode could be a standalone product with just a few more maps, characters, and missions. For me, the most disappointing part of Outbreak is that this event will only be around until April. If you haven’t played Rainbow Six: Siege in a few months, you should boot up the game again just to try this new mode.